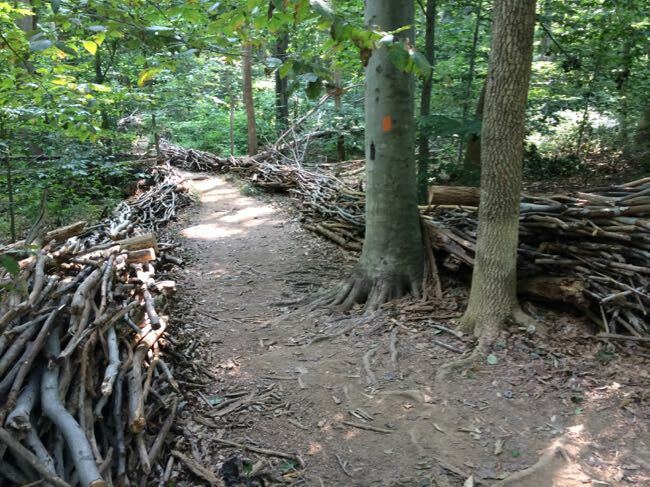 Our favorite things to do in Vienna Virginia combine small town fun with nature, music, craft beer, local dining, and interesting history. The town is less than 20 miles from Washington DC, and it is home to the only U.S. National Park devoted to the performing arts. 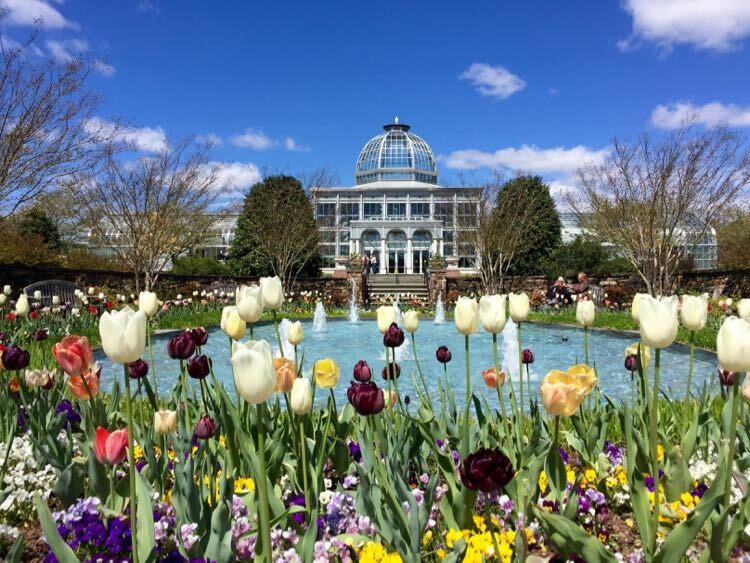 We’ve rounded up 8 great reasons to put a Vienna Virginia day trip on your travel list. 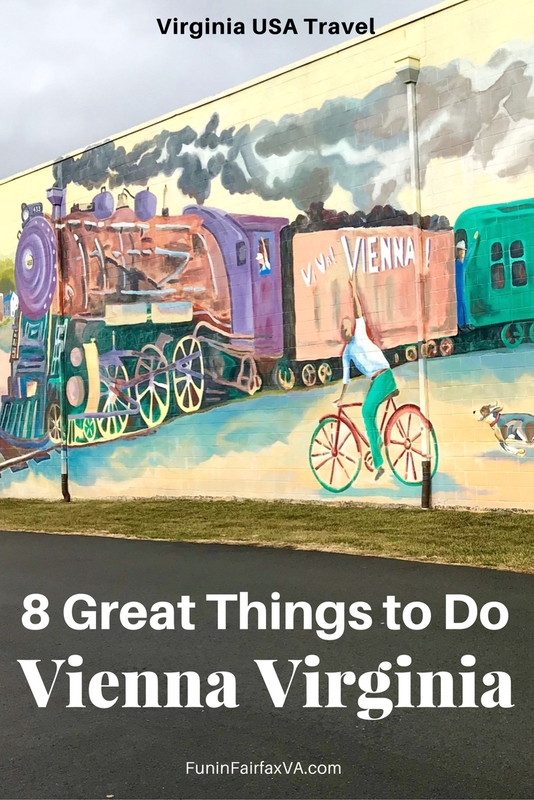 Here, in no particular order, are our favorite things to do in Vienna Virginia. Note that we are including locations with a Vienna postal address, some of which lie outside the Town of Vienna boundaries. 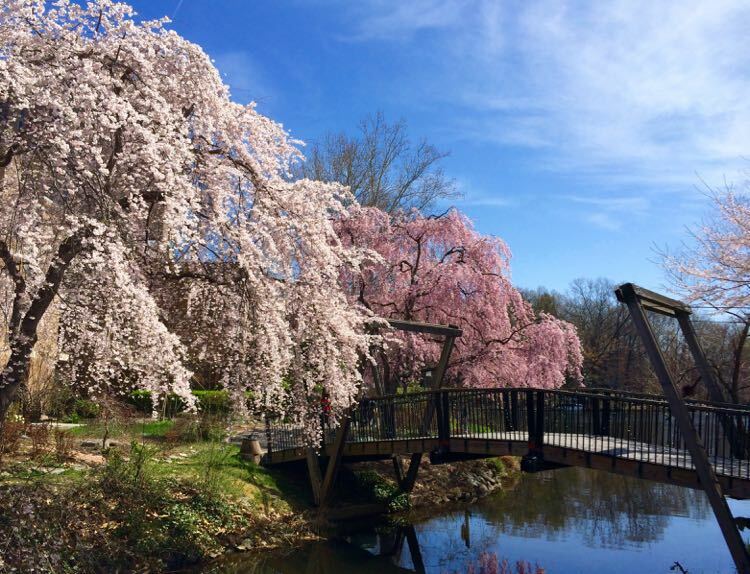 Meadowlark Botanical Gardens is truly a hidden gem of the Washington DC region, and a must visit for nature lovers. 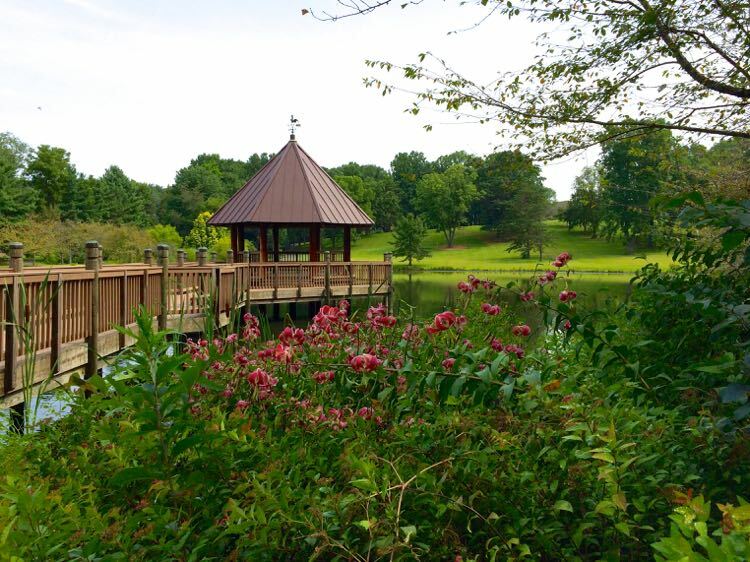 This beautiful park in Vienna Virginia is one of our favorite places for an adventure with young children or a multi-generational outing. 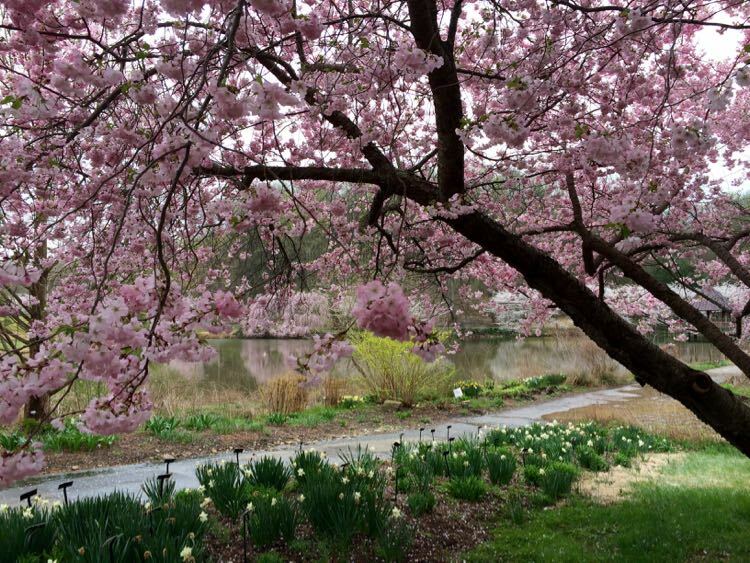 When the flowers are blooming, or fall foliage colors the trees, it’s perfect for a romantic stroll too. Enter Meadowlark at the Visitor Center, where you’ll pay a small entry fee and can check out nature displays, a small shop, and maps of the gardens. Paved and and natural paths guide visitors past themed gardens and ponds in the 95-acre property. Benches, rockers, and Adirondack chairs are tucked into quiet spots where you can enjoy the views. Youngsters can play in the Children’s Garden and watch koi fish from the gazebo. Be sure to visit the Korean Bell Garden, the only one of it’s kind on the east coast. Meadowlark Botanical Gardens opens at 10:00 daily; closing hours vary by season. Admission is $5.00, with discounts for youth and seniors. >> Read our full review of Meadowlark Botanical Garden now! 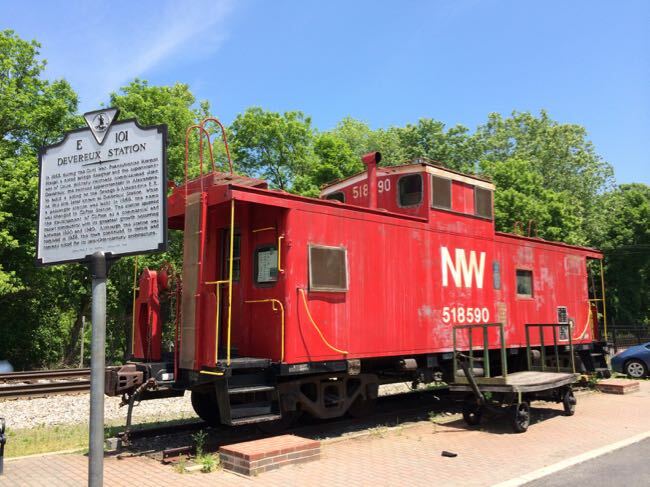 The Washington and Old Dominion Trail is a 44-mile long, rails-to-trails bike path that follows an historic railroad line. 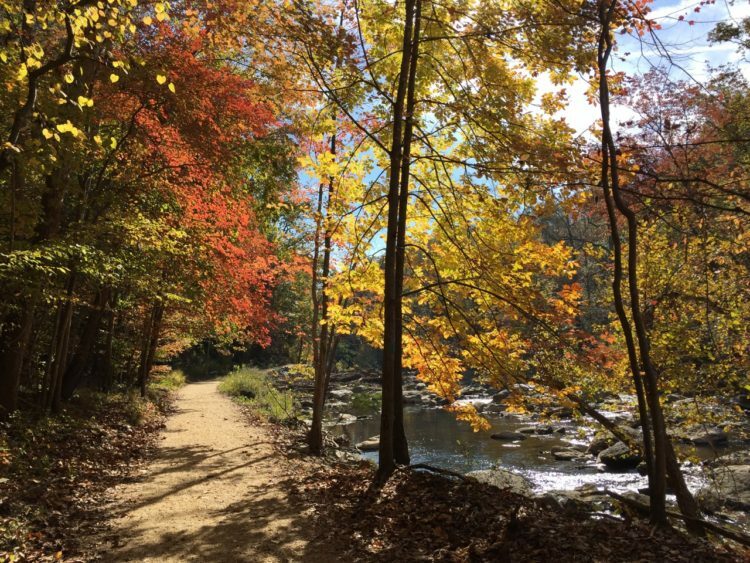 The stretch of trail from Hunter Mill Road to downtown Vienna is a very scenic place to walk, bike, or rollerblade. 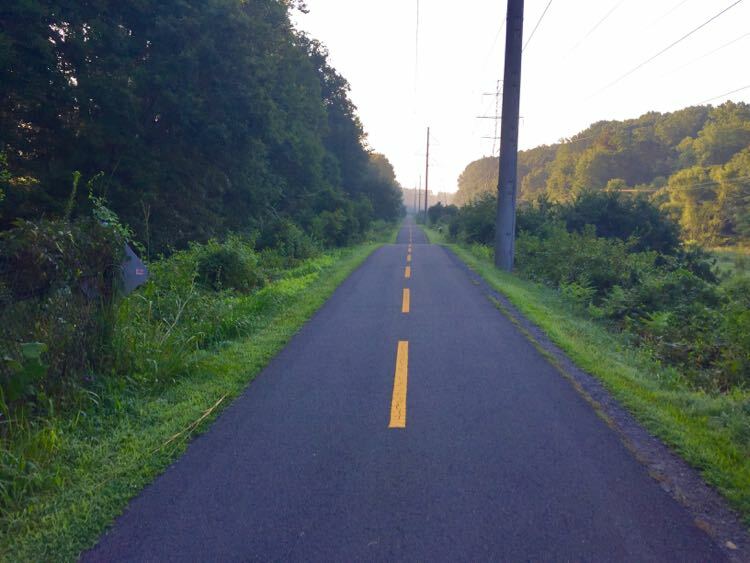 Once you reach the Vienna Virginia town boundary, the trail gets busier and frequent road crossings require extra caution. 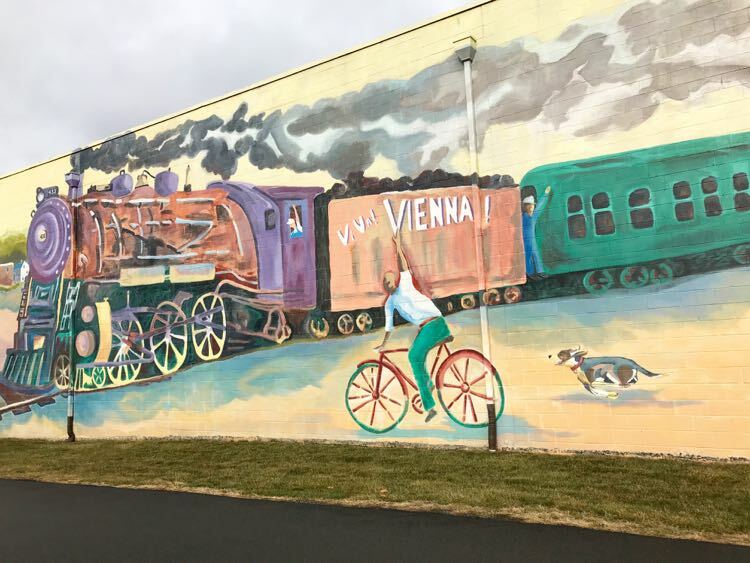 Stop at the historic train station to check out a vintage red caboose and admire the large Vienna mural. Most of our things to do in Vienna are easy to access from the W&OD, so biking is a good way to explore the town. The main street through Vienna is called Maple Ave, and it’s busy with restaurants, businesses, and a fair amount of traffic. Just a block away and parallel to Maple is quieter Church Street, a nice place to stroll and shop. Businesses on Church Street come and go, but there are always several worth a stop. Just Like New is an upscale consignment store packed with designer clothes, estate jewelry, and more. A block away, The Clock Shop of Vienna has over 500 clocks on display (they custom ordered a cuckoo clock for us). Closer to the bike trail you can buy handmade chocolates at Cocoa Vienna. When you’re ready for a break, head to our favorite coffee shop, Cafe Amouri. 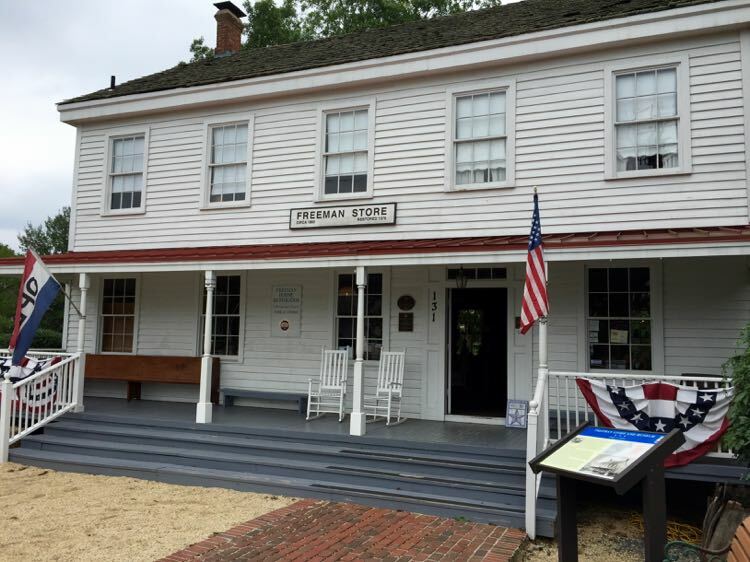 The Freeman Store and Museum and country store occupy a central spot in Vienna Virginia, at the intersection of the W&OD bike trail and Church Street. The building has been central to the community since it was built: in 1858 by Abram Lydecker. It operated as a general store serving Ayr Hill (now Vienna) for many years, and that history is preserved today. The small museum houses permanent and rotating displays on two floors. A display downstairs captures the look and feel of a general store in the 19th century. Upstairs there is a changing display related to life in rural Vienna Virginia. During our visit, displays have covered farming history, African-American history, and women’s fight for the right to vote. The Freeman Store is also an active General Store, and it’s a fun place to shop for gifts and toys with a throwback feel. The museum is generally open Wednesday to Sunday, noon to 4:00, but it closes in January and February. There is no admission charge. >> Read more about the Freeman Store and Museum now! Virginia is home to a vibrant craft beer scene, filled with interesting breweries and Beer Trails. 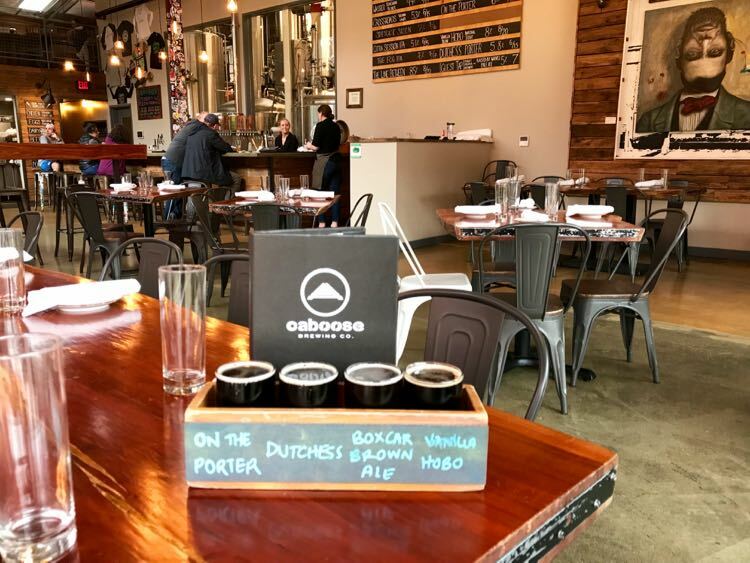 Vienna Virginia is lucky to have Caboose Brewing Company in the downtown area. Caboose is both brewery and restaurant. They serve a wonderful line-up of brews and delicious, locally sourced food. Order a flight or a pint and enjoy a spot indoors or out. The porters and stouts were standouts on our last visit, and our friend tucked in to a rich serving of mac-and-cheese. We’re fond of the pork belly and the crispy fries. Caboose Brewing Company is right next to the bike trail, a few blocks north of Church Street at the end of an industrial road. They are open Monday to Thursday, 4:00 to 11:00 pm, with longer hours on the weekends (Friday 12-12, Saturday 11-12, Sunday 11-10. >> Read our full review of Caboose Brewing Company now! When all this exploring makes you hungry, you have a LOT of choices for where to eat. Our favorite casual places to eat in downtown Vienna Virginia include Taco Bamba, Sweetleaf Cafe, and Pure Pasty. 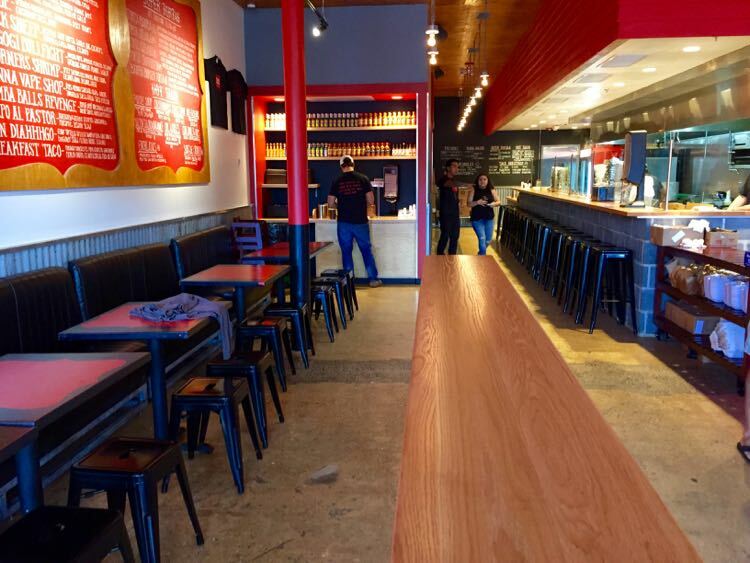 For sit-down dining we suggest Pazzo Pomodoro, Natta Thai, Maple Ave, and Bazin’s on Church. We hear great things about upscale Clarity, but we haven’t tried it yet. One of the coolest and most intimate music venues in the Washington DC region is located right in downtown Vienna Virginia. Jammin Java regularly sells out concerts in their intimate space, and is regularly recognized by Pollster Magazine as one of the Top 100 Venues in the world according to ticket sales. The business is owned and run by three brothers, and their music-loving/musician spirit shows. If you’re exploring Vienna Virginia with kids, check out their line-up of daytime Tot Rocks events. Enjoy music on a much larger scale at the only national park dedicated to live entertainment. Wolf Trap National Park is an indoor/outdoor venue hosting major musical acts and theater throughout the year. 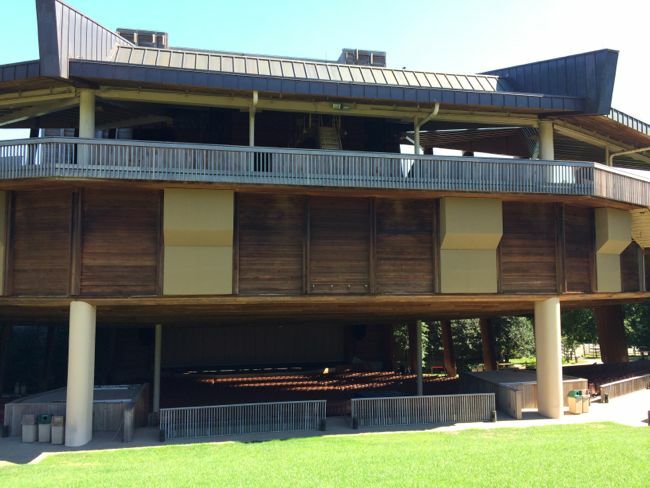 During the colder months, acts are housed indoors at the Barns at Wolf Trap. From May to December, the entertainment takes over the 7,000-seat Filene Center and the children’s-oriented Theater in the Woods. The Filene Center offers a combination of covered and lawn seating that is especially fun on a beautiful evening. Wolf Trap hosts a few very popular free events every year. Kick off the summer season at the annual Wolf Trap Summer Blast-off, featuring fireworks, and music by the President’s Own Marine Band. Finish the season at the annual Holiday Sing-along in early December. 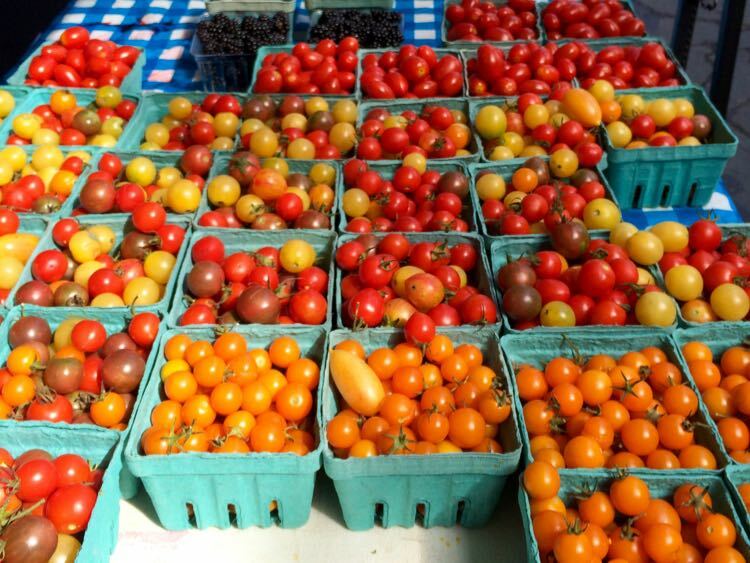 > See our full line-up of favorite annual festivals in Northern Virginia now! Wolf Trap is located just north of the Dulles Toll Road. It is reachable by bike from downtown Vienna on a combination of trails and surface roads, but expect to tackle some hills on the way. Vienna Virginia is easy to reach via the Washington Metro Orange Line, but it’s a little over 2 miles from the Vienna/Fairfax GMU Station to downtown Vienna. Grab a bus, taxi, or Uber at the Metro station if you don’t want to bike or walk that far. 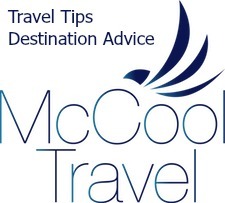 All of the destinations on our list are in the downtown area except Meadowlark Botanical Garden and Wolf Trap. Both of these are about 3 miles outside the downtown, and easy to reach on foot or by bike. 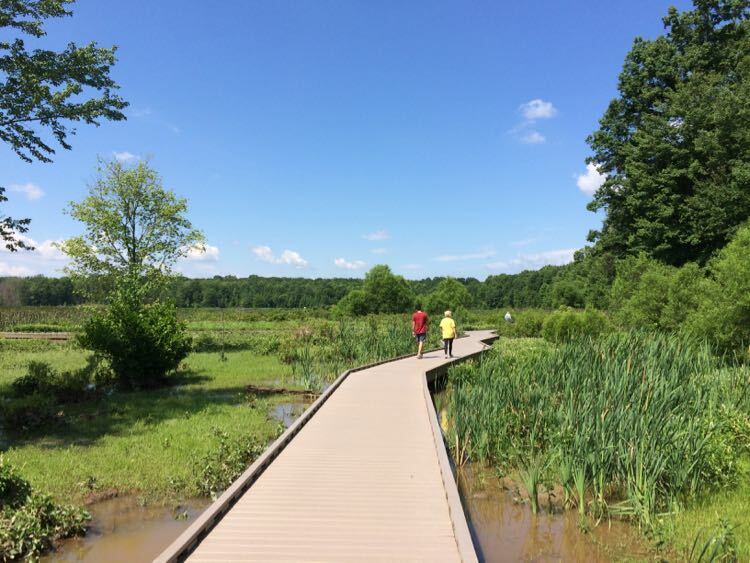 To reach Meadowlark by bike or on foot, follow the W&OD bike trail to the Meadowlark Connector trail. Be forewarned that the connector has some steep hills, but it’s a pretty route. If you plan to visit Vienna Virginia by car you’ll find free parking available in several downtown lots and along the bike trail. Parking is difficult during major events like the annual Viva Vienna! festival. Check the town website for a list of free and legal parking lots in town. Small towns like Vienna are one of the things we love most about living in Northern Virginia. There is always something new to explore, or a favorite restaurant or brewery calling us back. 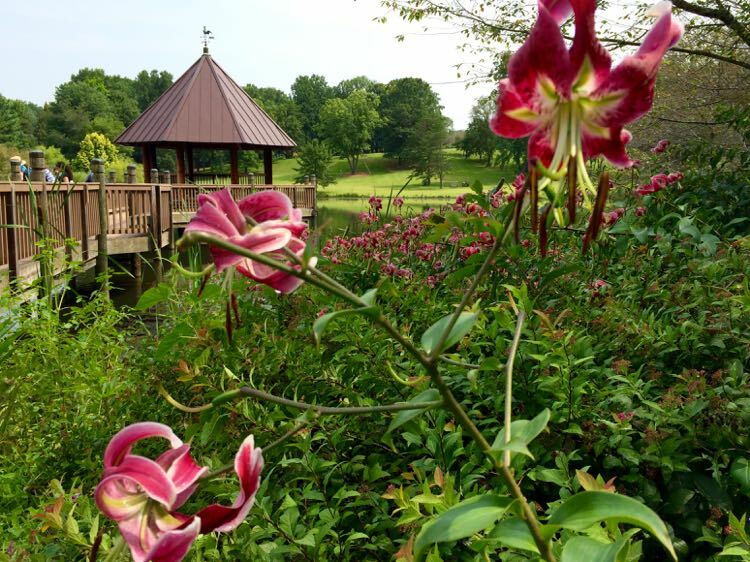 We hope our favorite things to do in Vienna Virginia inspire a visit. Vienna makes a fun day trip destination in the Washington DC area. If you’re a Vienna Virginia local we would love to hear your ideas about fun things to do in town. Please share your tips in the comments below. Thanks! Love the Caboose…their popcorn is pretty addictive too!!! Oh yum, that popcorn is tasty. Thanks for stopping by Colleen!